Flashfright is a 1-vs-3 minigame from Mario Party 7. Its name is a pun on "flashlight". The team reaches the courtyard, being followed by the solo player. Then, the gate closes. 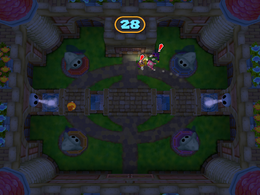 The game takes place at night in a castle courtyard decorated by several Shy Guy statues. A single player runs around with a Flashlight trying to expose the other three, who are dodging in and out of tombstones. If any one of the three player team manage to avoid detection for the given time, they win. The single player wins if they manage to expose all of them. If the single player wins, he or she does his or her victory animation as the other three are carried away by Fly Guys. If the three players win, the single player looks around and walks out of the courtyard while they perform their victory animation behind him or her. Rules – "One player attempts to shine a flashlight on the other 3 while they attempt to run and hide." Advice – "If you're being chased, run around the Shy Guy statues to keep your opponent guessing!" This page was last edited on August 4, 2017, at 21:52.